 COMETHA is a collaborative project started in 2014 and co-funded by the 7th Framework Programme of the European Union. 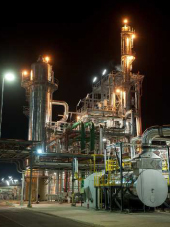 The scope of COMETHA is the construction and operation of an integrated industrial facility for the production of second generation bioethanol and other co-products from lignocellulosic feedstock. 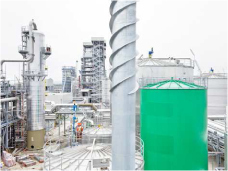 The plant will be the first of its kind at pre-commercial scale and will be based on the innovative PROESA® technology, developed by Biochemtex and successfully demonstrated at the Crescentino plant, that is operational since 2013 with a capacity of 40.000 tons per year of bioethanol. What progress beyond the state of the art will COMETHA achieve? The Crescentino plant was designed with some operative margins, in order to allow for the further optimization and improvement of processes and layout. 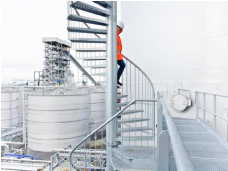 Relying on this technology validation phase, the COMETHA plant will then implement these improvements and will then represent an important milestone towards the real commercialization of cellulosic ethanol. • the valorisation of secondary streams and process integration. 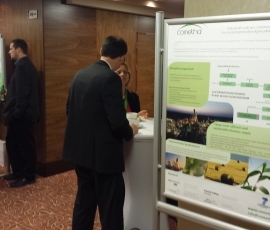 While implementing the industrial technology component, COMETHA will address the development of a sustainable biomass supply chain for the provision of lignocellulosic biomass, that will be necessary to fulfill the plant’s annual feedstock demand. The feedstock will be mainly constituted by dedicated perennial crops (Arundo donax) and agricultural residues. 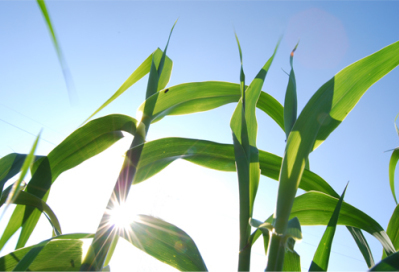 In parallel to the technological and feedstock supply component, COMETHA will develop a detailed life cycle assessment of the bioethanol flagship plant in order to demonstrate the actual GHG emission savings of second generation ethanol and the overall sustainability of the Biochemtex PROESAⓇ technology. Lignocellulosic feedstock is constituted by a matrix of cellulose and hemicellulose in close association with lignin that gives this material high chemical toughness and resistance. 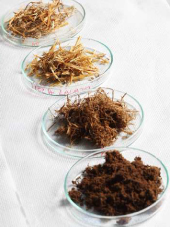 Therefore a number of processing steps are required to convert lignocellulosic biomass into sugars and then into biofuels. 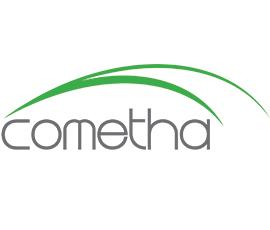 COMETHA aims at building a second generation plant based on an energy efficient pre-treatment process, that will enable optimal enzymatic and microorganism activities for the sustainable conversion of cellulose-hemicellulose sugars into ethanol. The plant will be based on the following key units and processes. The plant will be designed with high flexibility in terms of feedstock, and will be able to process both fresh and dry biomass. 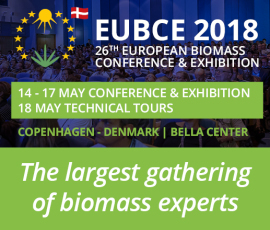 The COMETHA project will investigate the issues associated with the scale-up of raw material handling in order to achieve an economically efficient method of managing inlet biomass. In the COMETHA project, design improvements will be evaluated and adopted since the engineering phase in order to enable the scale-up of the pre-treatment technology in the flagship plant. • Adjustable degree of hydrolysis according to different requirements from other types of fermentation (i.e. sugars route to biochemical other than ethanol). In COMETHA, further research will be carried out in order to achieve high performances of enzymatic hydrolysis and mass transfer. 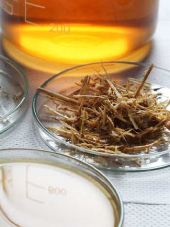 The enzymatic hydrolysis is a key step to make the feedstock available for an efficient fermentation of the lignocellulosic materials cellulose and hemicellulose. To develop a successful commercial process, all of the process steps of 2G technology need to be integrated as there is a complex interplay between them. 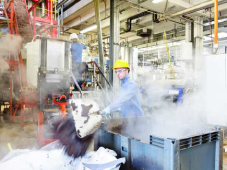 The aim of the partnership between Biochemtex and Novozymes in the COMETHA project is to develop, produce and utilize an enzyme mix with superior performance which will efficiently convert both cellulose and hemicellulose into C5 and C6 sugars. 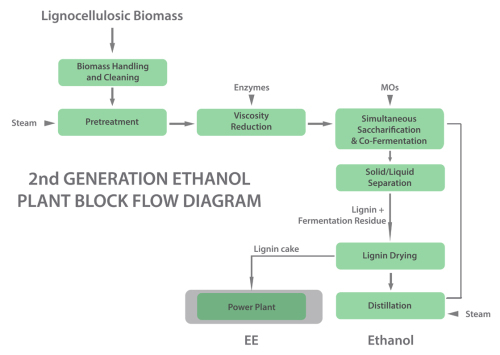 Several fermentation processes exist for the efficient production of ethanol at high concentration and productivity. 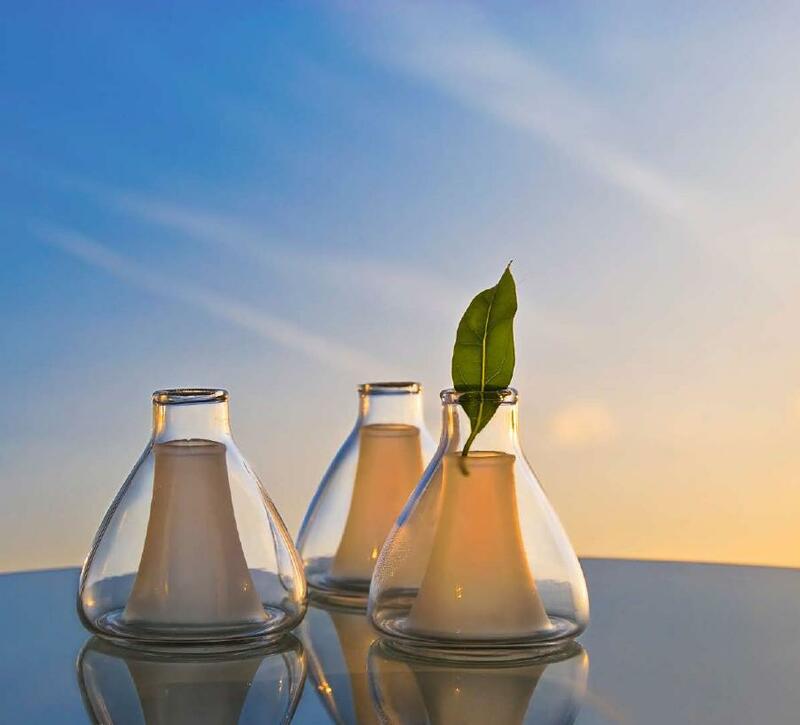 Among these, Simultaneous Saccharification and Cofermentation (SSCF) was selected by Biochemtex as key process for ethanol production. In this process, product streams from the pre-treatment stage are not separated but sent directly to the hydrolyzer/fermenter reactor. 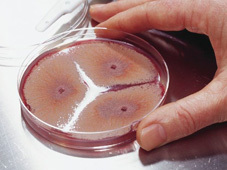 The challenge consists in fermenting both hexoses and pentoses in a bioreactor using a single microorganism. The separation of the unreacted solid is carried out at the exit of the reactor. This integrated system can convert more than 50% of all sugars that are potentially available in the original biomass feedstock. In terms of design, this configuration allows to use a small reaction volume with a low residence time, consequently the capital investment and production costs will be improved. The large amount of energy required for the distillation of ethanol from the fermentation broth is a significant element affecting the final production costs. Therefore improvements in this specific aspect would greatly benefit the overall process energy demand and economics. • Modeling of distillation configurations. The results of the Crescentino plant performance in the distillation phase will constitute the basis for improvement or process adjustment in COMETHA. This optimization will be mainly focused on the energy integration of the process by means of a proper managing of recycles and heat waste in the flagship plant. The outputs of the separation process are a wet solid fraction (lignin cake) and a liquid fraction (clarified stillage). The bottom stream (stillage) from the beer column is sent to the lignin separation package. This slurry will be then filtered to separate most of the insoluble solids, comprising mainly lignin, from the aqueous stream. The integrated water supply system will recover a significant amount of process water and will reduce freshwater demand and wastewater discharge into the environment. Wastewater is treated in anaerobic and aerobic digesters. Biogas from the anaerobic digester is used as boiler fuel and the solids are then separated from the water. The resulting sludge is also used as boiler fuel, while the treated water is recycled in the pre-treatment section as dilution water and partially drained. An industrial scale second generation biorefinery will require the establishment of an agricultural supply chain capable of providing an amount of lignocellulosic biomass in the range of hundreds of tons of dry matter every year in an environmentally and socio-economically sustainable way. 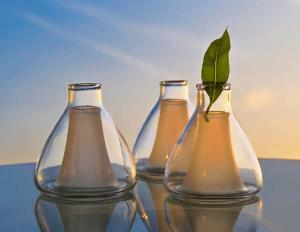 The plant will require continuous feeding with stable quantities and composition of the raw material. 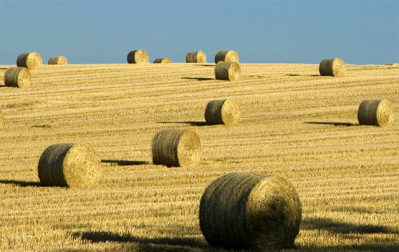 The agricultural supply chain will provide the plant with lignocellulosic biomass from both dedicated energy crops and agricultural residues. The combined use of different biomass sources with non-contemporary harvesting times, will be indispensable in order to provide uniformity of supply and the regular functioning of the plant. 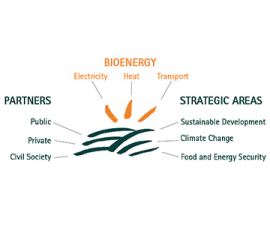 The biorefinery will be fed with fresh biomass from Arundo donax and agricultural residues in the seasons when they will be readily available from the fields. 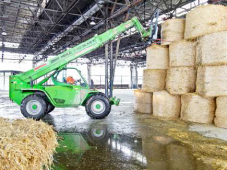 Sufficient stocks will be kept in form of Arundo straw and agricultural residue bales in order to guarantee the constant supply to the plant even in the autumn/winter period when rain or snow are likely to occur. 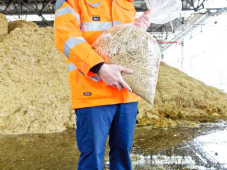 For agricultural residues it is expected to use indirect supply to the plant of dried and baled biomass for storage.